Yesterday we touched on lower crossed syndrome. Today, lets take a look at the steps we use to reset normal function. We know that by definition lower crossed syndrome is when one side is inactive or inhibited due to lifestyle, training, etc, and the other side is over-active, or short. Often times resetting the optimal length and stiffness on one side will restore function to the opposite side. What are the steps that we need to take to restore proper function in lower crossed syndrome? First, we need to restore the tissue quality to the area’s of tightness and over-activity. In the case of lower crossed syndrome, this would mean restoring tissue quality to the hip flexors and erectors. We can do this through several forms of stretching as well as soft tissue work like foam rolling, massage, etc. 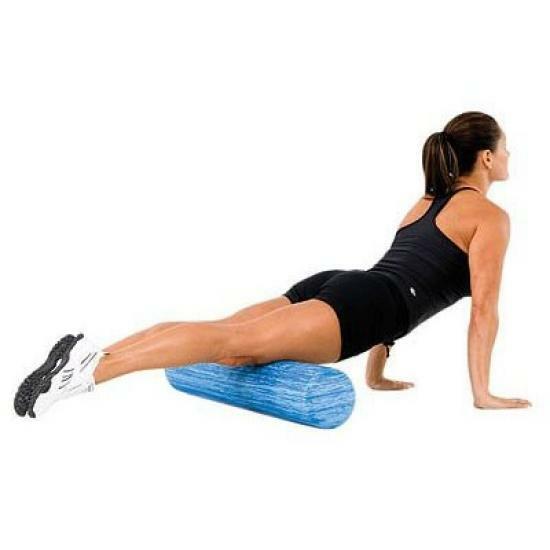 The foam roller should be your best friend! You may say well, “what about stretching the erectors?” I don’t believe in stretching the lower back. In this case we can restore proper tissue quality with foam rolling, and soft tissue work. I don’t ever want try to stretch the erectors. Again, check my post Quick Notes on the Low Back to see why I don’t recommend creating more movement there. 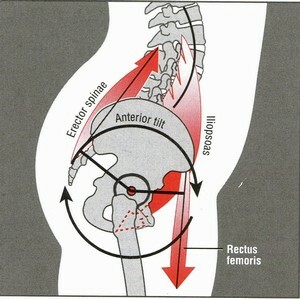 You can find more information on a past post Training the Hip Flexors. When we have anterior pelvic tilt and try to stretch the hips we must ensure to keep the abs tight and actually try to tilt the pelvis posteriorly. If we stay in anterior tilt and drive forward to stretch we don’t actually do anything but exacerbate the problem we already have. We must keep the hips and chest stacked on one another with the abs tight. I’ll actually use a self form of PNF stretching for the hip flexors. As the athlete drives forward we squeeze the back glute to open the hips even more. Drive forward into the stretch, not down! Next we need to get the inactive or inhibited muscles working for us again. We need to activate the glutes, as well as the abdominals. Now looking at the facts of anterior pelvic tilt, we should see that the hamstrings are continually on stretch if the front of the pelvis is rotated down. Hamstring injuries are common with anterior pelvic tilt / lower crossed syndrome. Many coaches first choice is we need to stretch the hamstrings. WRONG!!! It’s not that they are tight, it’s completely the opposite. So you can see referring back to an older post, Strains, the site of injury usually isn’t the area of dysfunction. If you were to continue to stretch out the already stretched hamstrings you are making no progress, and actually causing more problems. With that in mind a great exercise for increasing glute activation is the single leg knee to chest hip raise. Holding the knee to the chest while performing a single leg hip raise takes the pelvis out of anterior tilt, and does not allow for tilt, or lumbar extension that can often times compensate for glute activation in a hip raise. Ideally we’d like to start with 5-10 reps each leg with a count pause at the top, then progress to pauses all the way up to ten seconds on each leg. Every rep you should focus on squeezing with the back glute as hard as possible. Also we need to strengthen the abdominals on the front side. We accomplish this by using ISO holds in the plank position for time. We have several variations of these ISO holds including moving the arms and/or the legs to increase the intensity, and also adding weight to the hips when the athletes have advanced. Generally, the abs need to be strengthened with a neutral pelvic position. We can also start to integrate our activation work into our training. When doing squats, RDL’s, and such always squeezing the glutes through full hip extension at the top. As well, any single leg work such as split squats, lunges, and Bulgarian split squats are great for the glutes.